Guys, I'm starting a new column for my blog called Blog & Cookies. 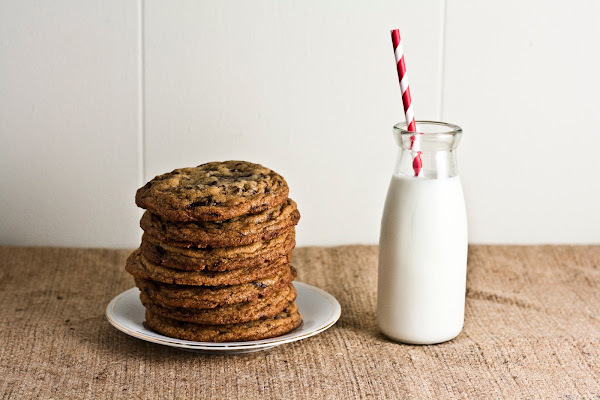 In addition to featuring a cookie recipe, Blog & Cookies will discuss the behind-the-scenes aspect of this blog; that is, what it's like to actually run a food blog. When I first started this blog in 2011, I had no idea about how much a time and effort it takes to run a food blog, let alone a successful one. I didn't realize that, not only did I need to have the baking chops, I also needed superb photographs and an interesting web design to be as compelling as the bloggers I admired. Let me follow all that with a disclaimer: I don't claim to be an expert in this topic. At all. Although I'm still very much in the process of learning the ropes, I'd like to share some of what I've learned these past few years just because there seems to be so little honest resources on the topic in general. No food blogger wants to admit that, hey, food blogging is actually all pretty hard. We all want everything to look fine and dandy, sugar and spice, and all things nice. But that's not the case at all. Or at least, it wasn't for me. 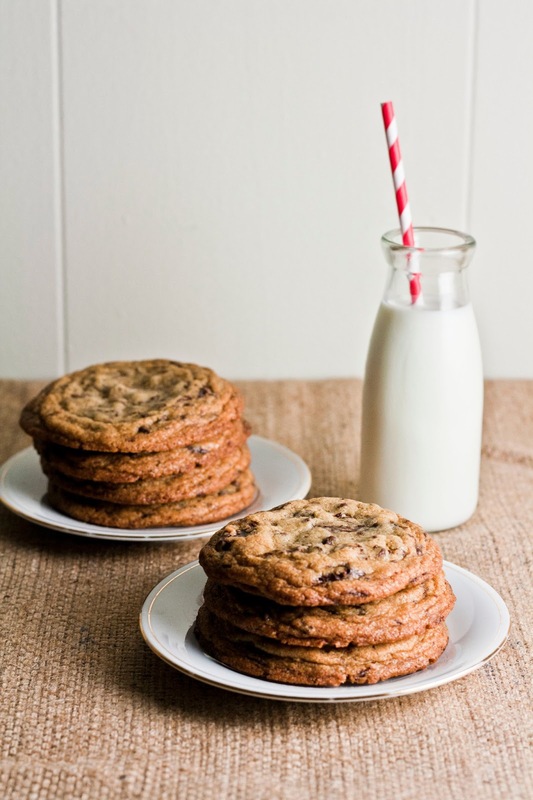 In addition to the topics above, I plan on presenting a different cookie with each post. 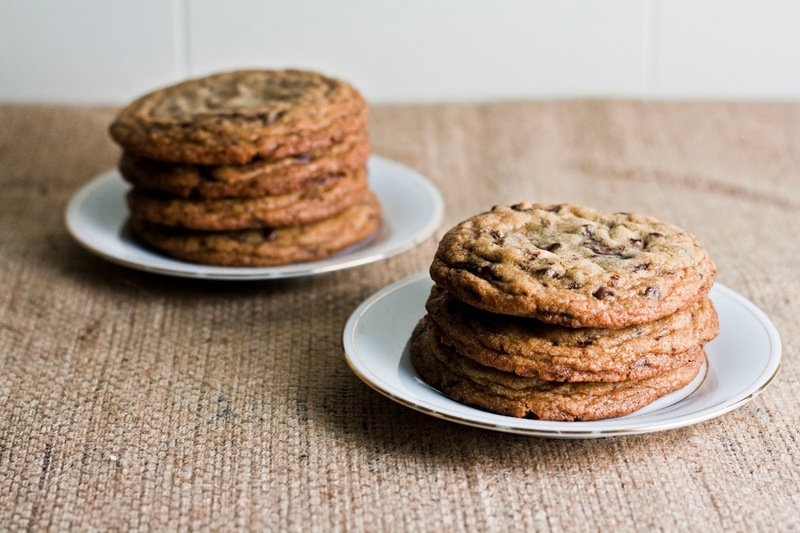 Think of it as some sort of educational forum with cookies — my dream is to have you make the cookie recipe, and as the cookies bake away in the oven, you read all about the column's topic. Or you can read them after baking the cookies too, whatever. Or not bake the cookies at all. But you really should, because the cookies will be delicious. This chocolate chip cookie is no joke. It hails from a very fancy and highly-lauded place — Thomas Keller's Bouchon Bakery. To tell you the truth, when I first bought the Bouchon Bakery Cookbook, I was intimidated. It's Thomas Keller's bakery, for goodness's sakes! How could I not be intimidated by the chef of the French Laundry, the restaurant which is frequently and often cited as the best restaurant in the world? Indeed, flipping through the cookbook is not for the faint-hearted. 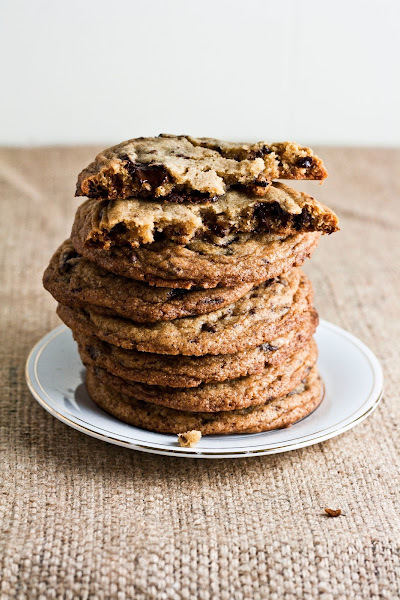 Filled with obscure tools, hard-to-find ingredients, and lectures of how one should weigh EVERYTHING, I was nearly scared away from this cookie recipe. But then I thought to myself — it's a friggin' chocolate chip cookie. How hard could it be? And indeed, as I went through the recipe's seemingly scary instructions, I started to understand it on my own terms: 60 grams of egg = 1 jumbo egg. 5.9 ounces of butter = slightly less than a stick and a half of butter. Why didn't Mr. Keller just say that? I almost rolled my eyes at the pretentiousness of the cookbook. 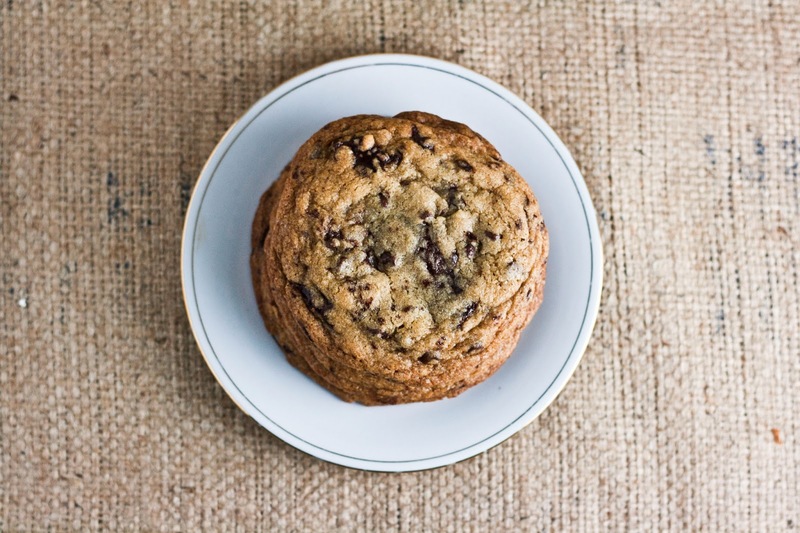 Without further ado, Mr. Keller's chocolate chip cookie recipe from the Bouchon Bakery Cookbook. Bear in mind that in my adaption, I've tried to make it more accessible and less intimidating to the public. Not only do I use the volume measurements he provides in the cookbook, but I also translated some of his more obscure measurements to more relatable ones. His original recipe also called for a HUGE cookie scoop to make 6 huge cookies (seriously, they were bigger than my hand), but I've altered the recipe to make 12 smaller ones. Don't get me wrong — my version is still pretty hearty and will be the size of your palm, but this way, there's more to share for everybody. Place 1 1/2 cups plus 3 tablespoons flour in a medium bowl, and sift in 1/2 teaspoon baking soda. Place 1/2 cup plus 2 tablespoons dark brown sugar and stir in 1 3/4 teaspoons molasses and 1/2 cup plus 1 teaspoon granulated sugar, breaking up any lumps. Don't worry about the mixture — you're only adding a little bit of molasses so it won't be completely smooth. Place 1 1/2 sticks unsalted butter in the bowl of a stand mixer fitted with a paddle attachment. Turn to medium-low speed and cream the butter until it has the consistency of mayonnaise and holds a peak when the paddle is lifted. Add the sugar and molasses mixture (from the second step) to the butter mixture (from the third step) and beat for 3 to 4 minutes, until fluffy. Use a rubber spatula to scrape down the sides of the bowl and add 1 egg, mixing on low speed for 15 to 30 seconds until just combined. Scrape down the sides of the bowl again. The mixture may look broken, but don't worry about it — overwhipping the eggs could cause the cookies to expand too much during the baking process, and then deflate. Add the dry ingredients (from the first step) in 2 additions, mixing on low speed for 15 to 30 seconds after each, or until just combined. Add 2/3 cup chocolate chunks and 1/2 cup semi-sweet chocolate chips and pulse on low speed about 10 times to combine the chocolate into the dough. While the dough is chilling, position the rack in the center of the oven and preheat to 350 (F). When the dough has chilled, use an ice cream scoop to divide the cookie dough into 12 equal portions (about 75 grams each). Roll each dough portion into a ball between the palms of your hands. Bake until golden brown, around 16 - 18 minutes. The cookies are large and will spread out during the baking process — be sure to bake only 4 on each pan, leaving enough space between each dough ball to spread at least 4 inches outwards. When the cookies are finished baking, transfer onto a wire rack to cool completely. They were possibly the most fiddly yet amazing chocolate chip cookies I have ever tasted! and so worth the fuss. you're photos are an inspiration :) Im guessing you've purchased the latest hummingbird book? Love this! I was just wondering, can you replace the molasses with more brown sugar, or is it necessary to have molasses? Hi Michelle, have you tried using light brown sugar? Will it make it a difference?